So what is a Bespoke Cocktail Service? I will create a tailor made cocktail, based on the answers given to questions pertaining to your lifestyle and drinks preferences. When the cocktail is designed, you will receive a recipe and full instructions on how to create your drink at home. You will also receive a handwritten letter from me, explaining why I chose your specific blend. The recipe and letter will be accompanied by a hand painted miniature bottle containing a free sample of the alcohol required to make your drink. The design on the miniature bottle can be used to reflect your personality and you can choose from the motifs available on my range of shot glasses, or you can design your own. If you are creating a cocktail to represent your company brand, I can paint your logo on to the bottle by hand. You will need to provide me with clear artwork that I can use as a reference. The order does not include the perishable elements of the cocktail such as fruit or mixers, but the instructions will be clear as to what must be added and there will be nothing that is not readily available in larger food stores. This service can be used to create a thoughtful and memorable gift for anyone who is partial to the occasional (or frequent) cocktail and is also a fantastic way to represent a company brand. With wedding season in full swing, this would be a perfect gift and what cocktail lover wouldn't be thrilled to receive a tailor made cocktail on their birthday? The price shown does not include a bespoke glass, but you can order one to match the design on the bottle or pick one from the large range of cocktail glasses and tumblers available. Prices range from £8 - £19. Please contact me to discuss your requirements. Once you have paid for your order, please allow 1 week until dispatch. Unfortunately this service is only available in the UK. Overseas customers can order a bespoke cocktail recipe with instructions, handwritten letter and glass. Please contact me through Etsy if you would like to discuss this further. The basic price for this service is £60. 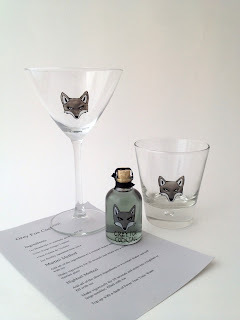 You can see the full details of the bespoke Grey Fox Cocktail , the Love Sonnet Cocktail, the Secret Tea Society Cocktail or the Velvet Teas Cocktail if you would like to see examples. I can begin the process of creating your bespoke cocktail as soon as you complete the questionnaire, but please contact me in advance to discuss your requirements. Click here to contact me. All orders must be paid for before work can commence. When I have received your response and payment through the link to Etsy, it should take between 5-7 days to receive your bespoke cocktail.